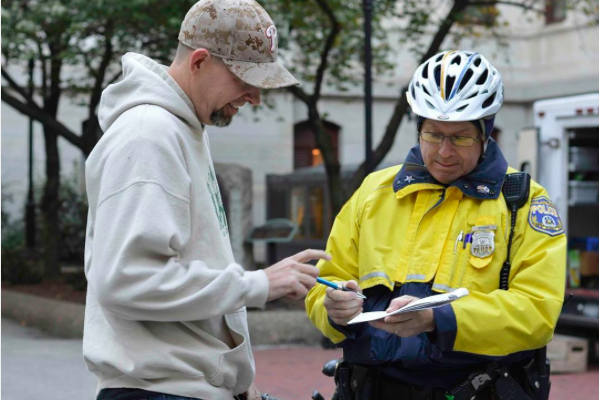 On the first day that Philadelphia decriminalized marijuana, Mike Whiter was issued a citation for smoking in public outside City Hall. The scene: the courtyard outside Philadelphia City Hall. His crime: smoking a joint. The reason for the sarcastic quotation marks in that last paragraph: On Oct. 20, 2014, Mayor Michael Nutter signed a Council bill into law decriminalizing the possession (and smoking) of small amounts of marijuana. Tuesday morning’s result? That lack of law-enforcement interest in a U.S. Marine Corps combat vet who tokes up to stave off post-traumatic stress disorder flare-ups is emblematic of a 365-day-old trend. What the shift in priorities means is that, instead of getting arrested, those caught with less than 30 grams of herb get a citation and $25 fine while those who get caught smoking it get hit with a $100 citation. On the flipside, most of those fines aren’t getting paid, something that leaves mayoral candidate Jim Kenney – who pushed for the decriminalization move while on City Council – considering taking it a step further should he get elected mayor Nov. 3. But let’s not get ahead of ourselves – with visions of an Amsterdam district along the Delaware – quite yet. On this, the first anniversary of Philly’s pot-punishment evolution, PhillyVoice checked in with a couple folks who hope that, one day, decriminalization becomes outright legalization. Whiter spoke about suicide attempts and being overprescribed pills to help handle an illness that marijuana addresses considerably better. Whiter is hoping for the outright legalization of smoking marijuana in public. "Who am I hurting? No one. There don’t even need to be fines,” he said. “Once I found cannabis, I haven’t turned back. That’s why I’m so brazen about it. For his part, N.A. Poe – a pro-marijuana activist who’s organized many a smoke-in in his day – is hosting an anniversary party for this “important holiday” at Connie’s Ric Rac in South Philly Tuesday night. Poe said it’s been a great year thanks to declining arrests and police cooperation with the new ordinance, something Commissioner Charles Ramsey wasn’t all that keen on during the early stages. Poe hopes that Kenney – if elected – will do away with the fines altogether, as what Philly has done in the past year stands up as a model for other municipalities across the state where marijuana arrests continue to pile up. Poe noted that he’s hosted numerous out-of-town visitors who are “so impressed with not having to worry about things like” getting arrested for smoking weed. He’s currently investigating how to bring members-only marijuana-smoking clubs to the city and ways to collectively pay off arrestees’ unpaid fines. Chris Goldstein is Philadelphia's marijuana blogger of note. He said Tuesday that fears voiced by opponents of the move (namely, that people would be smoking weed publicly all over the city) didn't even come close to being realized. He said public-smoking citations represent a very small fraction of the overall number, giving credit to both the decriminalization effort and the Small Amounts of Marijuana (SAM) program instituted in 2010 by District Attorney Seth Williams' office. "People aren't out there smoking in crowds, unless they're at an Eagles tailgate," he chided. "None of the fears have played out. In fact, [police spokesman] Lt. John Stanford recently told me that it's been a good thing for helping to close the schools-to-prison pipeline. It doesn't saddle juveniles [who get arrested] with records. Expunging juvenile records is an expensive, time-consuming process." Goldstein also looked to stats to make his case. Primarily, he said, the rest of the state is arresting twice as many people on marijuana charges as for offenses related to cocaine and heroin. That, however, is not the case in Philadelphia, where police are arresting three times as many people on cocaine and heroin charges as marijuana. "Philly flipped that; we have significantly more arrests for harder drugs. And, that speaks to a concern that police should be focused on more serious crimes," he said. Goldstein does remain concerned about lingering racial disparities when it comes to African-Americans being arrested at higher rates than whites. The latter offenders are more likely to get the stern-look, throw-joint-away treatment than the former. But, as a big-picture advancement, it's been a net positive. "I think we've shown the rest of the commonwealth a practical model. There's no reason 17,000 people should face a criminal misdemeanor charge for marijuana possession," he said. "The policy should be taken statewide. [Gov. Tom] Wolf has said he's fully behind it. After a year of this, we've set a good example of how it should be taken statewide." Asked about moving forward with it, Poe likened the effort to advances made by the LGBTQ community, which has continually pushed its agenda forward rather than cooling its heels with each accomplishment. “If you say anything bad about anybody LGBTQ, you’re a pariah. … Across the country, bold people stand up for what they believe in. Those people can help push this forward. Each step we take, we’re continuing to break ground,” he said, noting cannabis activists can follow that model. That last note struck a chord with me, considering this is an opinion column written by a guy who calls his personal blog "Philly Blunt." Thanks for championing this cause, and not just because it – hypothetically speaking, wink, nudge – makes some friends of mine feel more comfortable about sparking one-hitters somewhere besides under blankets in basements with fans on. Nope. What makes this move so special is that it won't saddle folks with a lifelong criminal record for doing something that shouldn't be illegal in the first place. The rest of the benefits are tasty side dishes akin to 2 a.m. chili-cheese dogs eaten while watching "Dazed and Confused."